Therefore, while you choose a bank, you always look for ATMs at your close proximity. Are you one of those who want to opt for traditional banking but hesitate as you are not sure whether or not your financial information will be kept private? 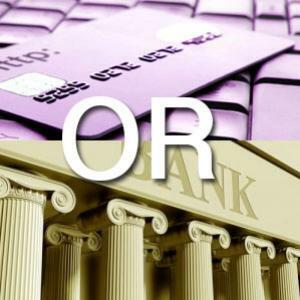 Or, do you prefer online banking but often prefer some of the traditional banking techniques? Have a look below to decide whether traditional banking or online banking is for you. ATM facility - The ultimate reason of banking is that you can withdraw money whenever you want to. Therefore, while you choose a bank, you always look for ATMs at your close proximity. Most of the popular banks have ATMs in the popular locations in most cities. However, if you choose online banking, they also have agreements with major banks which allow you to withdraw amount without paying any surcharge. Even if you use out-of-network ATMs, then also most of these online banks reimburse their valued customers to some extent. In terms of security - This is one of the prime factors which you consider to choose traditional banking over online banking. However, before making your decision on this criterion, remember that the traditional banks store all your financial information in a data center; so, it can also be hacked. On the other hand, if you choose an online bank which is backed by FDIC (Federal Deposit Insurance Corporation), then it will cover your losses to a limit of $250,000. However, while banking online, do not ever use a shared or public computer or WiFi connection in order to prevent your financial information from being stolen. The service you get - Customer service is an important factor to consider. Therefore, if you prefer talking face-to-face, then you should go for traditional banking. However, usually traditional banks have online message centers and call centers, too. So, you may have to get answers to your queries over phone, if you're far away from any branch or if it's not within normal banking hours or if it's a holiday. Nevertheless, online banks are rarely closed. The required deposit amount - It has been found that most people opt to deposit checks physically, even if they check balances online. But, there are options like âeDeposits' or mailing checks provided by online banks. The fees you need to pay - Most of the online banks offer a privilege to the customers; you, the customer, can keep relatively lower monthly balances and need to pay much less fees as compared to traditional banks. Rate of interest offered - Usually, the interest rate offered by an online bank is much more than that of a traditional bank. This is because the online banks don't need funds to maintain many buildings (several physical branches). One of the prime reasons for choosing traditional banking is that you feel comfortable to work with a banker with whom you have developed a good relation over the years. However, you never know when that person will be transferred to another branch or he/she might change his/her job. So, if you can confidently use technology, then online banking can be a much convenient option for you. However, think about the pros and cons of both the options and choose one which seems to be the best option for you.